This is a dangerous button. Don’t push it. The universe might start up again like a computer. All may be deleted. All memories may be gone. Everything may start anew. Or, press it anyway, precisely because you want all this to happen! And then it will be become clear that the button does not work. The universe remains its unapproachable self. No button can make it restart. Why would you want to push this button? Because you want to cross the street of course. But I think I would also press it if I just happened to walk by. I know that the universe will not start anew, yet still it is tempting to press this button. Is it because of this millisecond of doubt? Imagine… Imagine that it will work after all… Does this doubt not make it attractive to press the button? If only to prove that of course I can’t be fooled. Or, maybe I want to play if only for a second with this barely conscious temptation to change the course of history. Or maybe I want to make a statement: look, this is how inapproachable the universe really is. The button makes you very aware of this. Nothing happens. A restart is impossible. Ryan Laughlin works as a designer and he studies at Yale. He was only 18, when he posted a great number of these kind of images in New Haven, Connecticut, all with different texts. They were inspired by the well-known ‘Total Crisis Panic Button’ by artist Jason Eppink. This type of art is made nearly everywhere, but it was this image by Laughlin that became very popular. I came across it on a blog somewhere, without any mention of its source, just as an illustration. Apparently this work touches on something that is of concern to us. You reboot a computer, when it gets jammed. Does this image by Laughlin have a bearing on a feeling that our world got jammed and that a radical restart is indeed necessary? Or, does an image like this touch on something much smaller such as for instance a quarrel at work, which makes you wish just for a moment that everything could be different? When you have made a mistake, you may also wish that you could delete the day. In this sense forgiveness is a kind of reboot. And Christ’s resurrection is a reboot of the universe. The movie Groundhog Day takes this idea to its extreme. The main character, the gloomy weather man Phil Connors, wakes up every morning on the same day. It keeps on being February 2 and every morning everything is the same. Just like a restart of your computer. The programs are the same, the only difference is what you do with them. Do you write hate mail or a love letter, to just mention one choice you could make. Connors learns in the movie that he can indeed do things differently and be a blessing to others. He becomes a kind of resurrection. But is this work by Laughlin art? You cannot buy it. It does not hang in a museum. It does not have a title. There is no beauty in it. If it is art, then it is conceptual art, posing and discussing ideas. Or, is it just a joke by a young designer? Yes, it is that as well – a good joke, doing what a lot of good art does: opening a possibility. Just for a moment you consider if this might be possible and if you would want this to happen. This work points moreover to the most extreme ‘other possibility’: a new universe. A world without fall. This button feeds, like much good art, our longing for resurrection. 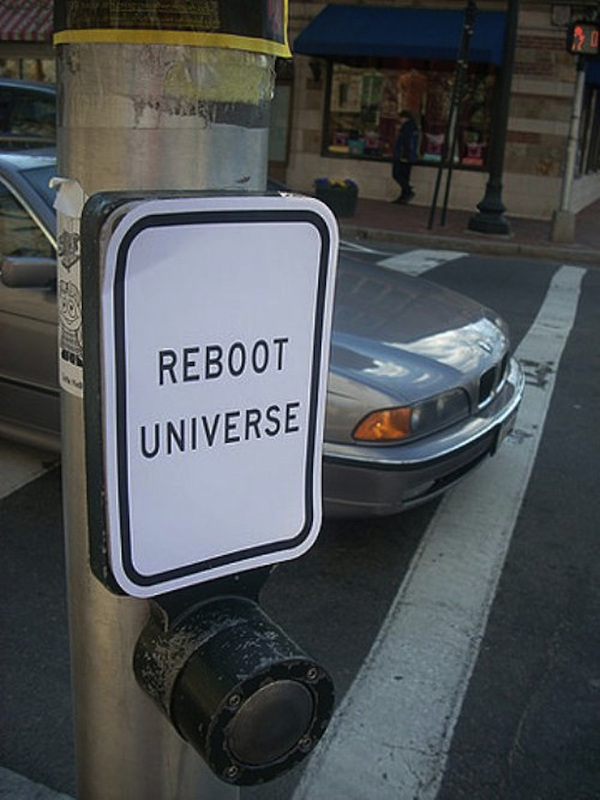 Ryan Laughlin: Reboot Universe, 2009. Ryan Laughlin (b. 1991) is a developer and designer based in New Haven, CT. He is in his third year at Yale University, working towards a major in Computer Science and doing various kinds of design work and web development on the side. In the fall of 2009 he took a middle-of-college gap year to move to Seattle, where he took a number of freelance web jobs while pursuing some personal projects in music, art, and creative writing. He performs as The Bare Minimum, a one-man musical group, and used to sing and beatbox with Out of the Blue, a co-ed pop-rock a cappella group at Yale.